The Green Clay Konjac 6 Wave Sponge is the perfect bath sponge for oily and blemish-prone skin as it tightens pores, tones the skin and revitalises damaged skin cells. Blended with the finest French Clay this naturally draws out impurities and toxins, and stimulates blood flow to invigorate your skin. Ergonomically designed with 6 waves, this Konjac Bath Sponge with French Green Clay is approximately 13.5 cm wide, perfect for use in the shower or bath. 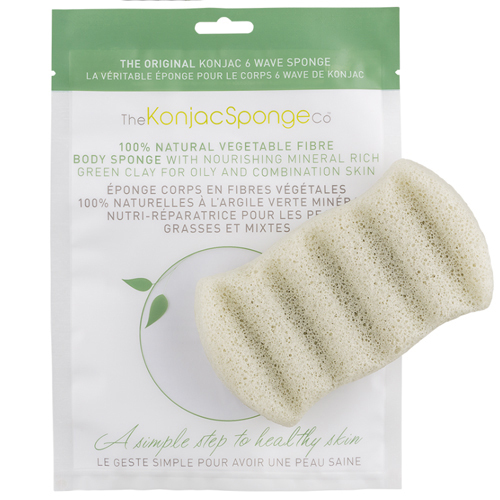 The Green Clay Konjac 6 Wave Sponge is additive free, helps balance pH levels and is suitable for sensitive skin leaving the skin feeling radiant and rejuvenated. 100% Natural Konjac Fibre with Green Clay. Below are reviews of The Konjac Sponge Co Konjac 6 Wave Sponge - Green by bodykind customers. If you have tried this product we'd love to hear what you think so please leave a review. 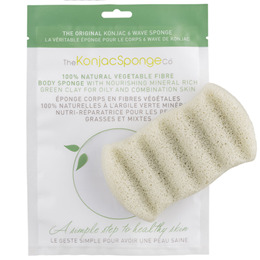 The Konjac Sponge Co - Konjac 6 Wave Sponge - Green Clay is the perfect bath sponge for oily and blemish-prone skin, the Konjac Bath Sponge with French Green Clay tightens pores, tones the skin and revitalises damaged skin cells.